MANILA, Philippines - Banana cue vendor Elha Nympha was named second grand champion of ABS-CBN's hit singing competition 'The Voice Kids' Philippines in the grand finals night held on Sunday, August 30, 2015 at the Newport Performing Arts, Theater, Resorts World Manila in Pasay City. The 11-year old kid from Quezon City received a recording contract from MCA Music Inc., a music instrument package, a family utility vehicle, a house and lot worth P2 million, P1 million cash, and a P1 million trust fund. The Voice Kids Grand Finale was a stiff competition between two teams: Reynan Dal-Anay and Esang de Torres of Team Lea and Sassa Dagdag and Elha Nympha of Team Bamboo. Elha from Team Bamboo got the highest accumulated number of votes (42.16%) from the 3 rounds namely a duet with a celebrity, upbeat song (performed on Saturday) and power ballad round on the results night. Reynan placed second with 31.64%, followed by Esang with 18.16%. Sassa got the lowest percentage of 8.04. The partial results of votes for the Saturday rounds were revealed before the final competition started on Sunday. They were ranked as artist KIDS - 15.72%, 31.87%, 8.54% and 43.86% respectively. In the power ballad round, Sassa performed first and sang 'Next in Line'. 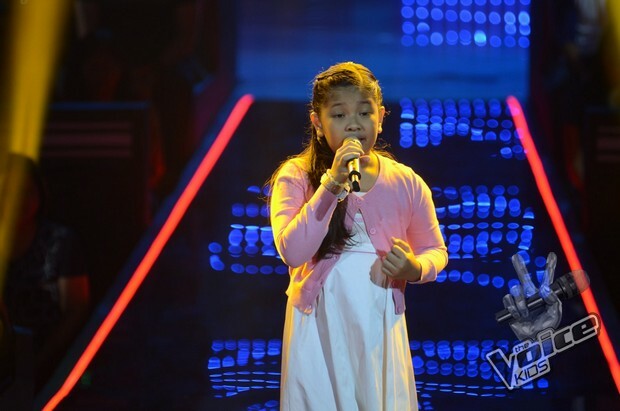 “That was effortless, that was pure class” Coach Bamboo told Sassa. Reynan gave a powerful rendition of Magkaisa, the emotional theme song of EDSA 1986. “Proud na proud ang Tribo mo!” Coach Lea told Reynan. Elha once again impressed the crowd with her rendition of “Ikaw Ang Lahat Sa Akin." “She is a very special singer. Undeniable” Coach Bamboo said to her. Last but not the least to perform on Sunday was the 'Little Princess' Esang and gave her vocal prowess as she sang “Somewhere." “You deserve this championship” Coach Lea to Esang. The live show on Sunday also featured original collaboration of 'Voice Kids' coaches Lea Salonga, Sarah Geronimo and Bamboo Mañalac as they performed Yeng Constantino's "Sariling Awit Natin." The finale episode tops online conversations with '#TVK2Finale' and 'The Voice' among the trending topics.